ON a beautiful winter’s afternoon what a delight it was to see the Wesley Uniting Church (including the loft) filled to capacity for this performance of Haydn’s glorious music. He composed “The Creation” in 1798, inspired after a visit to England where he heard performances of Handel’s great works “The Messiah” and “Israel in Egypt”. The oratorio (basically an opera based on a sacred subject) is in parts commencing with “Representation of Chaos” – an orchestral prelude that uses stark chords to portray the disorder that preceded the Creation. The six days of Creation occupy the remainder of the first and second part with each day introduced in recitative by the archangels – Raphael, Gabriel and Uriel. Each new creation (light, water, landscape, plants and animals) is depicted with tender musical painting. The third part tells the Adam and Eve story with Raphael now Adam and Gabriel now Eve. 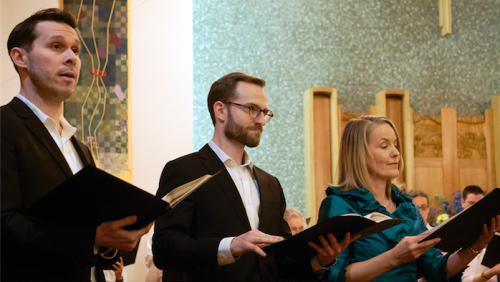 The oratorio focuses on their happy union culminating in their marriage. There was much to like about this performance which was highlighted by wonderful singing from soprano Rachael Duncan as Gabriel/Eve and baritone David Greco as Raphael/Adam. Both filled the church with rich tonal quality, obvious passion and enjoyment in their presentation and excellent diction that enabled every word to be heard with clarity. Tenor Charles Hudson sang Uriel. He had nervous moments during his initial aria and was not as domineering as his two partners but he settled well to demonstrate a gentle lyrical quality well in keeping with his role. The 26-piece orchestra was generally well balanced and, apart from untidy playing during some of the most taxing moments, coped with the varied and tricky score most competently. Phrase endings tended to be loose and intonation, particularly in the strings, suffered during exposed, delicate moments. Full ensemble sound was bold and brassy but did overpower the choir during chorus features. There were particular moments of orchestral beauty – the flute of Jodie Petrov was just lovely in the Gabriel aria “On Mighty Pens” and the oboe accompaniment from Chayla Ueckert-Smith in the duet “By Thee with Bliss” was hauntingly delicate. Principal violinist Helena Popovic led the orchestra with assured, authoritative and confident playing and Anthony Smith’s harpsichord playing was absolutely solid, clean and dependable as expected from a talented musician of his calibre and experience. 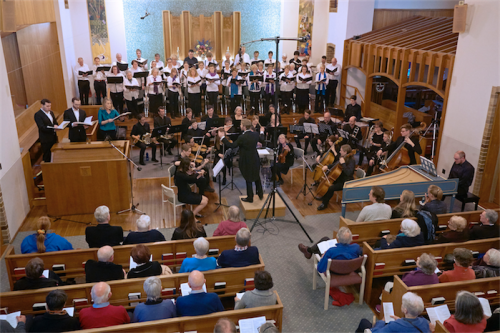 The 45-member ANU Choral Society (SCUNA) sang well with only a few tentative moments. Some entries lacked surety, which meant timid entries on occasions. Choir balance was generally fine with an excellent soprano group soaring powerfully about the rest. I’d just love to have seen and heard more animation from the choir, which did sound restrained and staid. I’m sure Haydn would have rejoiced had lyrics such as: “The heavens are telling the glory of God” been sung with great gusto, enthusiasm, passion and vigour. And even a smile of delight or two! There is an old adage that an audience listens with its eyes and this audience did need to see real joy matching the aural sensation. Conductor Leonard Weiss marshalled his considerable forces well. He controlled tempo, style and colour variation in a tight, disciplined manner, the only downside was allowing the orchestra to dominate the choir during the tutti chorus work. It was lovely to hear this glorious music in the appropriate Wesley setting. The presentation was a credit to the community forces who prepared the performance. While perhaps not totally uplifting, it was a most pleasant and enjoyable musical afternoon.